We talked about it, looked at books about it, and today we're building it! The forecast is for a low of 20 degrees tonight, and if we plan on eating any of our own kale, swiss chard, parsley, beet greens, and calabrese this is it. 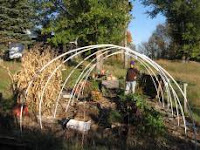 We looked at a number of different plans, and finally settled on this hoophouse plan from the Westside Gardener. We bantered about plans using fencing, hay bales, plastic roofing, etc., but decided for ease of access and long-term use this is the one to go with. We measured the size we wanted using a garden hose to roughly sketch the shape. Then we removed the pallets we use for paths to clear the area for planting the stakes. Some need to be replaced anyway, and the set on the right of where the hoophouse will go I wanted to replace with boards to make a narrower path. One of my other beds is much too narrow, and this is as good an excuse as any to expand it. We finished up around sunset, and closed everything down tight for the night. We covered the swiss chard as we were concerned we hadn't retained enough heat to protect them ultimately. They most likely would have been fine, but we were feeling paranoid. All in all, we're really happy with the space. It's larger than we expected, and so we're going to experiment with growing various things, starting some seeds, and even installing a cold frame inside to see what difference that will make. According to Four Season Harvest (a great book on growing year round), that gives even greater protection and expands your veggie options.